Good vintage condition with minor losses to gilt rim and minor wear to black print. 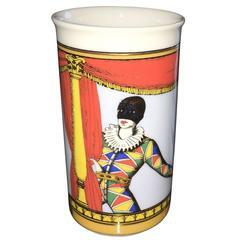 Offered is a mid century modern brightly colored court jester themed petite vase by Fornasetti for Rosenthal. Vintage Fornasetti porcelain dish as a ashtray or pin tray, with the print of French newspaper, Le Figaro. Porcelain pebble paperweight with a decor of a character from the Commedia dell'arte: Pulcinella (Punchinello) by Piero Fornasetti, circa 1950. Signature under the base. Piero Fornasetti ceramic ashtray with musical instruments illustrated. Signed on the backside - "Fornasetti Milano Made in Italy". Milano Italy, 1950s.